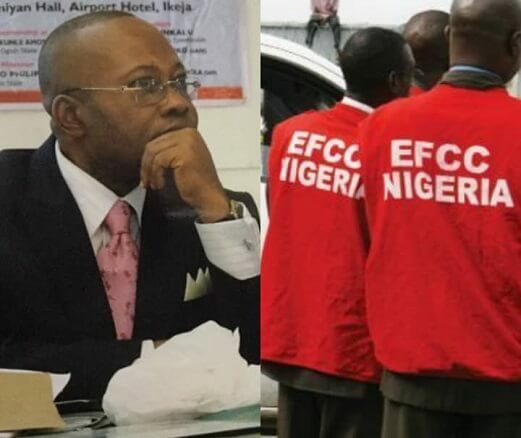 The Economic and Financial Crimes Commission (EFCC) on Wednesday, April 11 today released the ex-vice president of Nigerian Bar Association (NBA), Monday Ubani. Ubani was arrested and detained on Tuesday, March 19, along with Senator Christopher Enai for failing to produce the former Managing Director of Nigeria Social Insurance Trust Fund, NSITF, Mrs Ngozi Olejeme who they both stood for as sureties. Olojeme is facing a N6.4 billion fraud charge preferred against her by the anti-graft commission. Since Ubani’s arrest, there has been massive public outcry for his release especially after a Federal High Court order that EFCC should either release him or charge him to court. An FCT High Court in Abuja, had on Tuesday, April 9 granted leave for substituted service on the acting chairman of the EFCC, Ibrahim Magu. Justice Silvanus Oriji gave the order substituted service, after listening to the submissions of Chief Mike Ozekhome SAN, counsel to Ubani and Senator Enai. Oriji had on Tuesday, March 26, granted leave to an exparte motion filed by Ozekhome to charge Ubani and Enai to court or release them on bail on or before March, 28.